Welcome aboard Scaletech. Lots of good info here and as I'm sure you've read (hence the pictures) no pics, didn't happen. 1st pic: Nice boat . 2nd pic: Ouch ! Damage the hub or is it just going to be a bearing job? Thanks, La-Z-Buoy. I replaced both hubs just because they are not that expensive, and came with the bearing races already installed. There was some damage to the spindle, but I just used emory cloth on it until the new bearings would slide on easily. But, the pain isn't quite over because I just lost both bearing buddies somewhere on the highway after installing the new hubs. Maybe I over-greased the bearing buddies. They are not the best design IMO, just a friction fit like a cap. They should be threaded onto the hub. I've read that some people have drilled holes in the hub ends and installed set screws to bite into the bearing buddies to hold them in place. I have lost one on the road. First trip after installed. Put on replacement (same size as I had the original packaging of the first) and it is still there after a couple of years. This seems like a good place for this pic, on our way back from the jetty tips on the Nehalem...it was a good day. It's always good to have a plan. It's always better to have a good plan. New cover (which I love), new kicker (which I don't)...it's a fishin machine! been getting out on the water 2-3 times a week. Some guys like the walkaround boats, but I gotta say, I love that my boat has an inside and an outside. I love fishin, but I also like comfort! :) Sure the deck space is limited on the 16', but 90% of the time it's just me and my dog out there, and it's plenty. LOVIN' MY ARIMA! "When you get into one of these groups, there's only a couple ways you can get out. One, is death. The other...mental institutions"
Fish forever Work whenever !!!!! 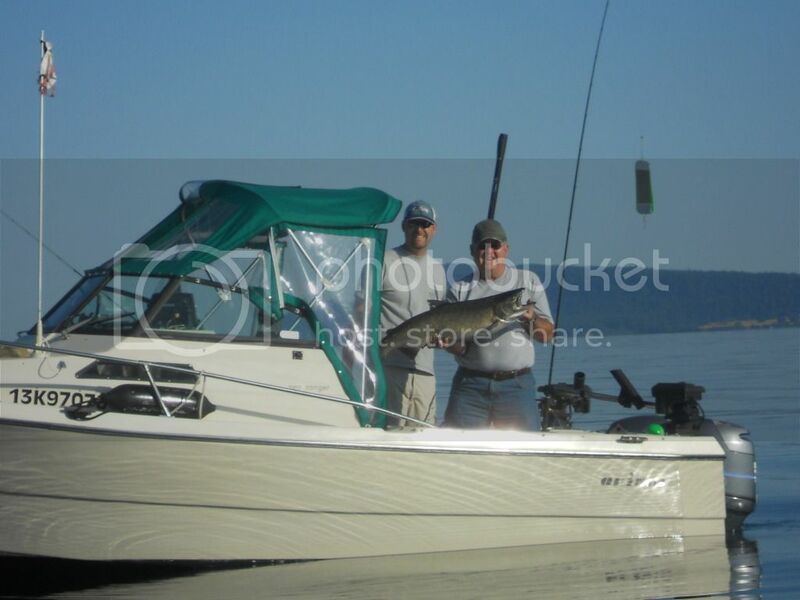 First is a picture of me reeling in a nice chinook on my new 19 chaser.....Second picture was of my uncle holding a nice 22-23lber, I guided him to in my old 17 sea ranger.. He is a die hard fisherman and hadn't caught a salmon in some time. It was caught 17 feet down in 25 feet of water, made a solid 150 yard run, was an absolutely amazing day on the water. 21' Sea Ranger Skip Tower, 150 VTEC FI Honda, Salt Boss with Yamaha T8 on 703 controller, hot box plumbed and Marine Tech P2. Solas 4-blade 14.75x15 aluminum prop. 2002 21' Arima Sea Ranger HT Suzuki DF175 4-stroke. WEDOCQ= WE DO SEKIU! It pays homage to my Uncle Jay who died of cancer. Albie blood bath!!! Should be the cover photo of bloodydecks.com!!! About half way through my eyes started to glaze over, but I counted 50 tuna in that line up. Nice job!! Who cleaned up the boat!?!? 2005 SL 22 "Stress Relief II"
'Arima Therapy' - Life begins where the land ends! Raymarine E120W, Digital HD Colour radar, Scotty HP 2106 DR's c/w 15 lb glow ballzzzz! Great to be here...was a lurker for awhile, but have been the recipient of many good ideas and how-tos. 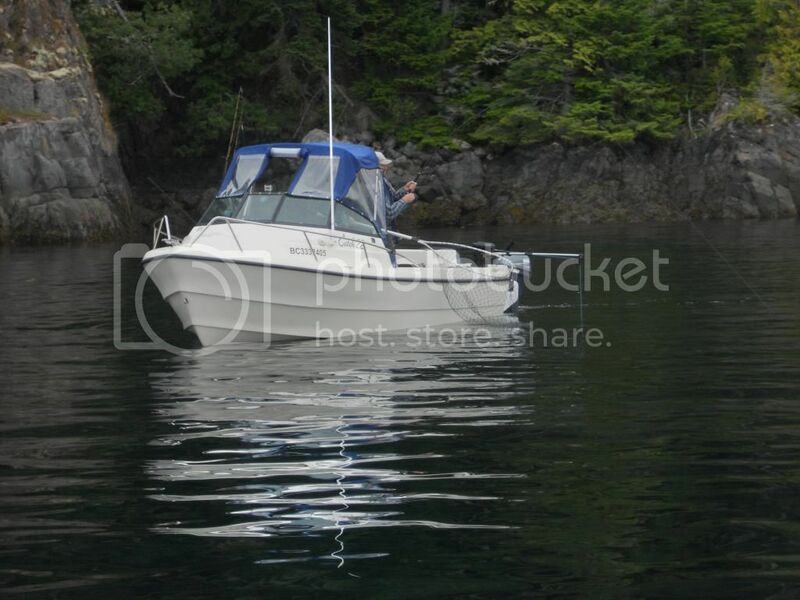 I bought THE FLYING PIG about a year ago from King Salmon Marine. 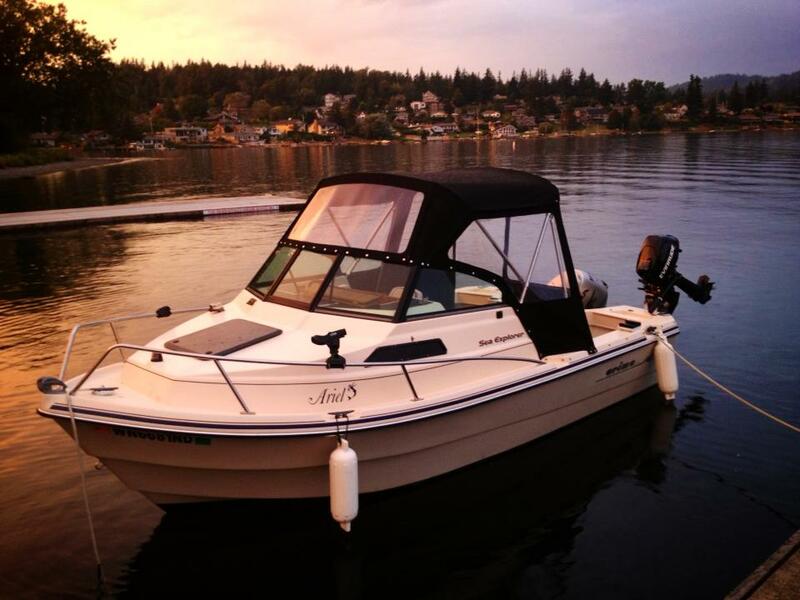 It's a 1996 Sea Ranger '19, with a 2010 Evinrude E-TEC which had 60 hours on it. 2) The dash was full of old holes from the previous engine, so I bought a thick piece of vinyl and redid the dash to clean it up. 3) Rewired the whole boat. The old wiring looked like a rat's nest, and I actually found a wire leading to the aft switch for the washdown water tank clipped together with two alligator clips. Fearing a friggin' fire, I decided to do it all the right way. 4) Added mounts for downriggers, and my home made crabpot puller. 6) Added a T-Top from Atlantic Towers. This was a PITA, and while the quality of the product is good, the fitment needed a little "adjusting". Fortunately, I have a good friend who's smarter than me on such things, and we essentially pulled the structure apart wide enough, and past the yield point of the metal so it would fit width wise. 7) To keep momma warm, I ended up getting new canvas made to fit the T-Top. I met a guy at the Seattle boat show last year, and had him look at the boat. He offers polycarbonate windows as an upgrade, which I elected to buy after years of really disliking isinglass. While I doubt I'd do it, he says he has customers that run windshield wipers on the stuff. He was very easy to work with, and made many suggestions.....even picked out the colors of the canvas to match the Evinrude's logo. I'm sure I missed something, but pics are in my gallery. Also after looking and learning from this site, am going to add another bildge pump, and I want to upgrade the seats to the tempress elite high back helm seats. If any of you have any experience with those, I'm all ears. Welcome to the board. Nice to have another E-Tec owner. (which I 'ope it won't 'appen to me). Wow, that top is SWEET! Welcome aboard, DSledgeR!